Operatives of the Anti-Kidnapping unit have arrested a restaurant waiter, Meshack Felix, for allegedly kidnapping his boss’ three-year-old grandson in Lagos. 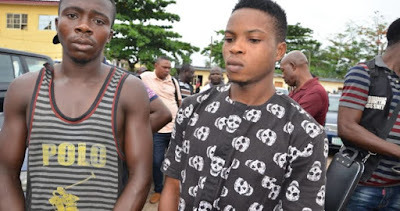 The suspect’s younger brother, Chinecherem, was also arrested for providing his account number for payment of ransom. The incident occurred on June 4, at Dog Kennel, Railway Compound, Ebute-Metta, Lagos. According to the state Police Commissioner, Imohimi Edgal, the victim’s mother, Mary Chidi, reported that she suspected Felix abducted and took her grandson to an unknown destination. Edgal said: “She also stated that two days after the disappearance of the child, the said Meshack Felix sent her a Diamond Bank account number 0081873532 belonging to one Chinecherem Felix and demanded a ransom of N600, 000 or the boy would be killed. The boy’s father, who was at the command headquarters on Thursday, said “he’s my only child and he stays with his mother at my mother-in-law’s place. Narrating how she employed him, the victim’s grandmother said Felix had come to her pleading to be offered a job and he felt compassion for him. Confessing to the crime, Felix exonerated his younger brother, saying he planned and executed it alone because he needed money to buy equipment for his welding business. He said: “My brother Chinecherem does not know anything about the kidnapping. I kidnapped the boy alone and demanded for the ransom so that I can get money to buy equipment for my welding job. I am a welder by profession but there is no money for me to start on my own business. Corroborating Felix, Chinecherem said his brother told him the boy was his son when he asked after seeing the kid in the village.